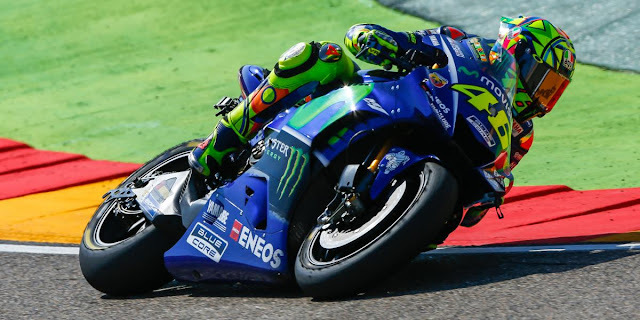 Only 23 days after breaking his tibia and fibula in a crash when training, Valentino Rossi (Movistar Yamaha MotoGP) put himself on the front row for the Gran Premio Movistar de Aragon after even going straight through to Q2. With initial doubts about his fitness getting better and better every day, the number 46 is sure he can race – and will try his best, although it will be a challenge. Valentino Rossi, P3: “It’s a surprise for me and us, because I didn’t know what to expect. A week ago I started to think maybe it was possible to ride here, and I did some laps with the R1 thinking it could be possible but with some pain. But the leg has improved every day. The M1 is more comfortable and better for my size, riding yesterday in the wet was fine but I didn’t know in the dry. But this morning I felt quite good, I have some pain but not too much. My position on the bike isn’t perfect but quite close to the normal one, at first we changed some things but now I’m using the normal footpeg and seat position and for sure it’s better.